You guys are the Best! Found your website when I searched the web to have our very old, very out of tune piano tuned. You guys sent out Mark Herring and wow, he did a fabulous job. Mark took the piano apart, he cleaned it, pulled it up to pitch and tuned it beautifully! The sound is so solid and rich that it fills the entire room now. Fantastic! Many thanks for sending Mr. Mark Herring to us to have our baby grand tuned. 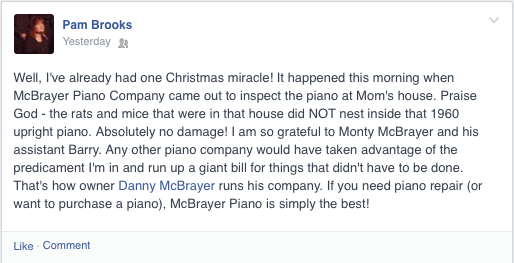 Mark did a great job in bringing our piano back to life. He is one of the very few technicians / musicians who really understands the theory underlying how a piano should be tuned. He’s a true craftsman. I just sent my piano off today with Monte and “Bear” and was so impressed with how I was treated! Monte took the time to explain in probably more detail then most people care to know about the inner workings of the action on my 1926 baby grand Vose and Sons. It’s quite obvious his love of his profession, but also his knowing how to treat the potential customer. Monte came to my home knowing I had done a “partial” restoration myself. He made me feel pretty good about the work I had been able to accomplish on my own. Because of those high remarks he made me feel that investing in the final portion of the restoration with them was the best way to go. It actually was a fair amount higher then I’d anticipated in cost, but because of how I was treated I know this will be a solid investment. I have a feeling that this little piano will play and sound as good as a Steinway! I can’t wait to hear my wife play when you bring it back. Thank you again and I can’t wait to write the follow up! I just wanted to say how pleased my wife is with our piano purchase. I can honestly say it took her by complete surprise to sit down in her comfy chair and to see her brand new Kawai just sitting there patiently waiting for her to play! She looked like a kid at Christmas. Thank you so much!